New York is a shopper's paradise; you can find anything and everything in the many stores throughout the city and now you can shop TAX FREE in NYC on clothing and shoes priced under $110. $40 All Ages (Includes Continental Breakfast) A nonrefundable deposit of $20 is required for seat reservation. Cash or Money Orders Only. All Sales are Final. Call Now to Reserve Your Seat! The Garment District is located between Sixth and Eighth Avenues from 34th to 40th Street. One Third of all clothing manufactured in the USA is designed and produced in this neighborhood. Many of the clothing manufactures maintain outlet stores open to the public. Century 21 is located at 22 Courtland near the World Trade Centers, is known for bargain priced merchandise. 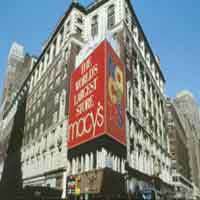 Macy's is located on Herald square near the Empire State Building is the largest department store in New York. Manhattan Mall is right across from Macy's near the Empire State Building at 6th Ave. and 33rd Street. Canal Street/ChinaTown- If you like to shop and you don't mind searching for a good bargain, head down to Canal Street where you'll find all kinds of action for the shopping maniac. Street vendors and small shops are packed in this area and you can always find a good deal. 7 - Flyer: Flyer can be printed. Click on the link below. Christ Temple Hosts will treat you with VIP Service. Check-in service by Christ Temple host. Scheduled Coach Bus from Christ Temple Church to New York and from New York to Christ Temple Church. First class air conditioned coach with experienced drivers. Shopping in City of New York.